The Holy Spirit ascends on the apostles, giving them boldness. N A LARGE upper room in Jerusalem one hundred and twenty men and women were meeting daily to pray. These were disciples and friends who had been with Jesus while he lived on earth. These were the ones he had commanded to wait in Jerusalem for the promise of the Holy Spirit from heaven. And they were obeying his command. Although Jesus had now gone up to heaven, where they could no longer see him or hear his voice, yet these people were happy. They remembered his words, that power from heaven would soon be given to them. And they were waiting to receive this wonderful power which would come with the gift of the Holy Spirit. Ten days passed by after Jesus ascended to heaven, and another feast-day came for the Jews. 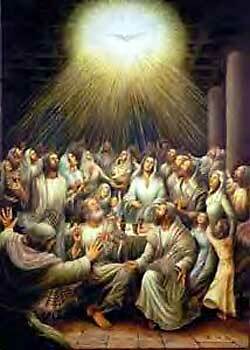 This was called the Pentecost, and religious Jews from other lands had come to worship at the temple. The city was once more crowded with strangers from different parts of the world. In the large upper room the disciples and friends of Jesus were together praying at an early hour. Suddenly there came a sound as of a rushing mighty wind. They understood the meaning of the sound from heaven, for at that very time the Holy Spirit came upon them. And they saw resting upon each other's heads what seemed to be tongue-shaped flames of fire. Now they knew the promise of the Holy Spirit had been fulfilled, and they began to praise God. No longer were they afraid lest the enemies who had caused Jesus to be put to death should hear them, for the Holy Spirit gave them boldness and courage to tell others that Jesus was really the Christ. Soon the noise of their rejoicing was heard in the street below, and crowds gathered to learn what had happened in the upper room. In the crowds were the strangers who had come from different countries far away, where people spoke in other languages. When they came to the place they were surprised to hear these happy men and women praising God in the languages of their own countrymen. The strangers looked on each other with amazement, and asked, "What does this mean? For these who speak to us in our own language are people from Galilee. How have they learned the language of the faraway nations where we were born?" Others in the crowd were Jews who had lived in Jerusalem for a long time. They had been there when Jesus was crucified, and when he rose from he grave. They knew these Spirit-filled men and women were friends of Jesus. And they refused to believe in him. So they said to the strangers, "These men who speak in your languages are drunk; pay no heed to them." Then Peter stood up boldly where all the crowd might see him, and said in a loud voice, "Ye men of Judah, and you who are strangers in Jerusalem, these are not drunk as you suppose. But on them God has poured out his Holy Spirit, as he promised in the prophecy of Joel, which reads thus in your Sacred Book: 'And it shall come to pass in the last days, say God, I will pour out my Spirit upon all people, and your sons and your daughters shall prophesy.'" When Peter began to speak the people grew quiet and listened to his words. And he preached to them a great sermon, showing them how God had sent his Son, Jesus, into the world to be their Redeemer. But they had refused to receive him and had given him over to the Roman soldiers to be killed as a wicked person. Yet God had raised him from the dead on the third day, and had received him back to heaven. Quietly the people listened, and Peter preached on, explaining to them why the Holy Spirit had fallen upon the friends of Jesus that day. And at the end of his sermon he proved to them that God had made the Jesus whom they crucified both Lord and Christ. Peter's words brought fear upon the people who stood listening. How guilty they felt! Now they cried out, "What shall we do?" And Peter replied, "Repent of the wrong you have done and be baptized in the name of Jesus Christ. Then God will forgive your sins and will give you the Holy Spirit as he has given us. For the promise of the Holy Spirit is given not only to us but to every one who shall believe on the Lord and be saved from sin." Because of Peter's great sermon many people believed that Jesus is the Son of God. And on that day three thousand believers were added to the one hundred and twenty who first met to worship God in the upper room. These believers were baptized in the name of the Lord Jesus, and they too, rejoiced greatly because they knew their sins had been forgiven. By the power of the Holy Spirit the apostles now worked many signs and wonders in Jerusalem, and fear fell upon the people who saw and heard them. And every day more believers were added to their number, until their congregation became a great company of people. Those who believed on Jesus sold their possessions and divided their money with those who were poor. And they met every day to praise God and worship him in the temple, and others who saw and heard them also believed. This was the beginning of the early Christian church, which is called in the Scriptures the "church of God."